Although we have been in business in the UK for over 30 years, this may be the first time you have dealt with us. If, for any reason whatsoever, ImmunoShield does not live up to your fullest expectations, simply call or email us, and we will give you an immediate, courteous and full refund, including postage. You need not even return any unused product. Order online here or call FREEPHONE 0800 279 7740 or 01296 630900. ImmunoShield is only available direct from Uni-Vite Healthcare Ltd on a world-wide basis. We do not sell through retail stores. Order online securely here, or we can take orders by mail, e-mail or phone. CALL FREE on 0800 279 7740 or national rate landline +44 (0)1296 630900. For larger orders or express delivery, please contact us by phone for the best postage rates. To order ImmunoShield along with other Uni-Vite products from our online catalogue, click here. 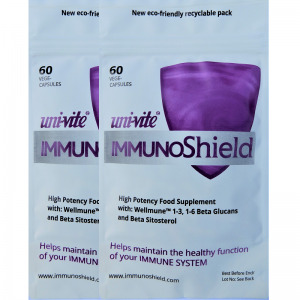 Each ImmunoShield caplet contains 250mg of highly purified Wellmune ® beta glucans and 100 mg of phytosterol complex incorporating beta sitosterol. 60 caplets represent two months’ supply for general immune enhancement. When you click Buy Now, you will go to Paypal’s secure checkout, where you can pay EITHER with a Paypal account, OR as a guest with major credit and debit cards. Orders are normally despatched by Royal Mail (post) from our warehouse in the UK on the next working day following your order. For UK addresses, goods should arrive within 2-3 working days; for Europe 3-5 days; outside Europe 5-7 days. Headline prices are quoted in UK £ including VAT. Select the country where you wish your order to be delivered from the dropdown menu against each pack size. The postage and VAT has been adjusted, so the amount shown is the total you will pay in UK £. Your payment will be debited in local currency. Online payments are processed with Paypal, and we therefore accept a Paypal account, or credit cards via Paypal. When you click the “Order now” button, you will be directed straight to Paypal’s secure site to complete your order. For telephone orders, we accept Paypal, Visa, Mastercard and Maestro cards (sorry, no AmEx or Diners Club). Our customers are loyal for a reason. Many have been with us for 5, 7, 10 years and more. These are their freely offered comments taken from a recent survey. These are individual views expressed by the contributors and not by Uni-Vite Healthcare. Opinions and results may vary from person to person. Uni-Vite is an established UK company with its head office in Aylesbury, Buckinghamshire. The raw materials in our products are high quality and expensive, but we don’t sell through retail shops so that we can keep our customer prices as fair as possible. Please do phone us during office hours with any questions, or contact us via email. You will speak to one of our experienced team of staff who work on site in Aylesbury.